I have lots of happy memories learning to bake with my Mum. My passion for food, baking, cooking and career in food design and development was fuelled by Mum and Grandma (Mum’s Mum). Mum has a big box file of recipes collected from magazines, newspapers, family and friends with hand written notes on hints, tips, tweaks & comments on the outcome. We would have a rummage through the file to decide what to make. A particular favourite was Marguerite Patten’s cake recipes and following my Facebook tribute to Marguerite I decided to make scones as a thank you to Mum & tribute to Marguerite, an iconic British cookery writer, who sadly passed away recently. For our American readers, this recipe is for British scones, which have less fat in the recipe versus American scones/biscuits. Read on, the final picture showing the serving suggestion should explain why! 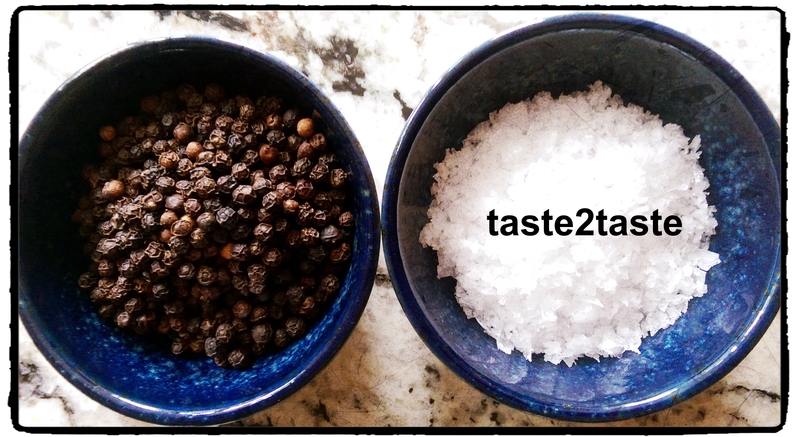 Here’s the basic recipe I use in pictorial form. Sift the flour, bicarbonate of soda & cream of tartar into a bowl and add a pinch of salt. Hint & tip 1: You can use 2 level teaspoons of baking powder instead of the bicarbonate of soda & cream of tartar. Rub the softened butter into the flour by hand until well incorporated resembling fine crumbs (bottom left photo below). Make a well in the centre and add the sugar & milk. Mix to form a soft but non sticky dough using your hand. If the mixture is a bit sticky add a teaspoon of extra flour. If the mixture is a bit dry add a teaspoon of extra milk. However try to avoid adding too much extra flour as the dough should be soft. Roll out on a lightly floured surface, also lightly flouring the rolling pin so the dough does not stick. Gently roll out until approximately 2cm/ 1 inch thick. 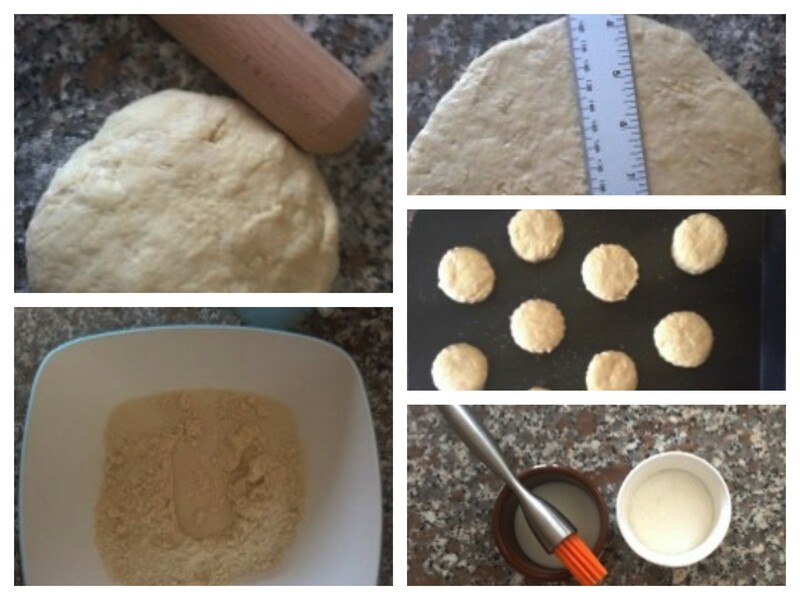 Hint & tip 3: the trick for well risen scones is not to roll the dough too thinly. Cut out into rounds using a metal cutter. I used a 5cm/2 inch cutter with a fluted edge for small scones but a larger cutter is fine too. Brush the top with milk. Hint & tip 4: make sure you don’t let the milk dribble down the sides as this will impede the scones rising evenly. Sprinkle some granulated sugar on top. Bake the scones on the top shelf for about 10 minutes or until they feel firm when gently pressed at the sides. Hint & tip 5: Avoid opening the oven door until nearly done as this will affect the rise. When baked take out the oven & leave to cool on a rack . I like to eat mine the traditional way with strawberry jam, lots of clotted cream and a lovely cup of Earl Grey tea. Thanks Mum (& Marguerite). 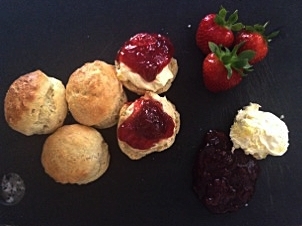 Scones – a perfect summer afternoon tea with jam, clotted cream and perhaps a glass of iced tea or even champagne! You need more authority links in order to rank. Best backlinking strategies in 2015 are backlinks pyramids and PBNs.